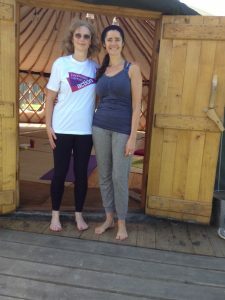 Haslemere Chiropractic Clinic’s latest charity event – Yoga in a Yurt – which was held today, raising money for the charity that we have chosen to support this year, Pancreatic Cancer Action. Pancreatic Cancer Action is a fantastic locally based charity raising awareness of the symptoms of pancreatic cancer to facilitate an early diagnosis, which is essential for the disease to be successfully treated. They also help to fund research, and provide support to anyone with a diagnosis of pancreatic cancer. The location was the Event Yurt at Night Pastures, near Fernhurst. This provided a truly beautiful and peaceful setting, with the yurt being located in a meadow adjacent to ancient woodland and a lake. 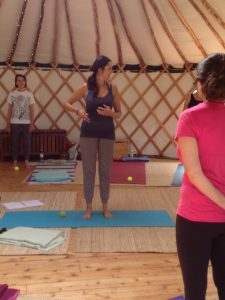 A big thank you to Louisa Burtwell for giving her time to share with us the relaxing and mindful Scaravelli inspired yoga that she teaches locally. Louisa also works as an aromatherapist, and has worked closely with Haslemere Chiropractic Clinic for many years. Michelle Carrington said ” I love the Scaravelli inspired yoga that Louisa teaches because it is all about being kind to your body, and really listening to what it is telling you”. Performing Yoga Poses For Charity! 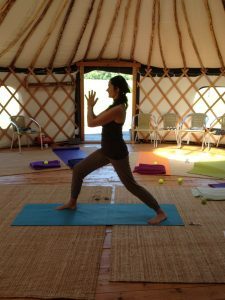 It was particularly enjoyable to be able to perform the yoga whilst being able to look up to the sky, and look at the meadow and woodland through the yurt windows; a real treat! The event was fully booked, with several people disappointed because they were unable to secure a place. This was the first time that we have organised anything like this, but it turned out to be a fantastic opportunity to raise money for charity, and to spend some time relaxing and gently working our bodies, which has always got to be a good thing! We were so grateful for the sunshine as we enjoyed our mid morning refreshments outside, really enjoying the tranquil surroundings. With a feast of fresh mint tea, coffee, berries, nuts and chocolate brownie all tastes were well catered for. It was such a lovely event that we may well repeat it later in the year, so please do let Reception know if you would be interested in coming should we do it again.